Kallev Littleton Kallev cried out as one of them decided to sacrifice something. No, the cycle will just start again.. she sighed as they were all freed at a cost. Do you think making a deal like that would be easy to circumvent. Even if she was some creation, each time you create her, this will happen and the god of the forest will have even more... You will have to create a different thing... she sighed, helpless to prevent him from sacrificing his companion Yana. She looks at the portal, then back at the fist girl she met and or carries her if neededthrows her into the portal instead of herself stepping thru for the moment, wondering if they could come back some how, unsure if they would inhabit her own body or not, but it was a chance worth taking. Effect: A witch can cause a creature within 30 feet to fall into a deep, magical sleep, as per the spell sleep. The creature receives a Will save to negate the effect. If the save fails, the creature falls asleep for a number of rounds equal to the witch?s level. Last edited by kaylara; 08-31-2018 at 12:05 PM. With Aurelius’s final compliance, the pool ripples spontaneously, and opens up into a mysterious wormhole. One of the lifeless beings then speaks up, admonishing them to venture in, and rejoin their companions. Jonathan notes that her voice and tone have altered into a warmer inflection. --A good sign indeed. Maybe the test was over and they had succeeded. The sense of freedom, is beginning to return. Alexis can smell it in fact! But Kallev doesn’t agree! She, at the last minute, changes her plans and throws the leading lifeless apparition into the portal instead of herself! --AHHH-- the feeling of release! Jonathan and his companions are vomited out into this new reality, along with the tossed apparition, now reunited with these other ‘friends,’ friends to Alexis and Kallev apparently. Jonathan looks back to see how the ghost girl has survived the transition. But then, the sight of the construct, Yana, being smuggled away by this mirror image of Aurelius, is heartbreaking! The innocent and loyal Yana, being snuffed-out and silenced, and watching the real Aurelius clutch his face in agony, only able to witness the consequences of his decision, completely humbles Jonathan beyond measure. Brave and Valiant the doctor is, willing to sacrifice someone so dear to him to save these new companions-- that he had only just met! Jonathan grits his teeth in remembrance of the oath he decreed to his new friend just a moment ago. This man is of noble spirit beyond any he has ever seen. Men like this must be encouraged and protected above others. Jonathan stands proud over Aurelius as a guardian, while the doctor haplessly begins to piece the life back into his fallen love. Watching the doctor administer numerous pints of crimson liquid-- vital plasma, his own no doubt-- is grueling and unfortunate to watch. Jonathan averts his eyes, but remains stalwart by the doctor’s side, for as long as it takes for him to reinvigorate his unfortunate sidekick. WHO’S THAT!!?! The moment is cut short as Rawncer eyes down this other man that has just been spit up from the ground as well, and is wrestling with swarming shades. Rawncer doesn’t recall seeing him before, squinting his eyes with careful scrutiny. This new individual is struggling through some extreme tournament with spectral arms grasping all over. Rawncer experiences a wave of compassion for the troubled man for a brief moment, but he remains stern at a distance, knowing not to trust anything too quickly in this forsaken jungle. He’s got a fell energy about him friends, speaking indirectly to Aurelius and Alexis. I can’t place it, but there’s some faint and unwholesome tinge about him, I’m detecting. - Corruption Resistance(spell-like ability - 1cast/day): 1Hour per level if cast on self. Naming good alignment. Last edited by WhiteStag; 09-03-2018 at 06:22 PM. It was a reality shattering return to the forest as the plant creature that was Kelebros had essentially vomited them from the pods where they were being digested. Prior to her departure, Kallev tries to grab the eyeless girl and throw her into the portal that had formed in front of them, in the hopes that perhaps she could free them as well, but found that her hands merely passed through the girl... like a shade. "Good bye... sister. It is too late for us. We are bound to my brother until the end of creation. Just as he is bound to us." The girl says cryptically, her voice echoing only in Kallev's mind. She hands Kallev a small pendant. Kallev recalls the pendant around the neck of the girl in the vision shown to her on the night of her murder. "The hand of the Lady of Shadow is upon you. You will need this." With that Kallev is sucked out into the vortex behind the others and finds herself deposited rather unceremoniously next to the others... as they bore witness to the gruesome unmaking of Kelebros and the hushed whispers of malice and hate his victims spat at their tormentor. The roles in the very twisted justice of the plane playing out as the lord now becomes the lowly and the powerless take their gruesome revenge as they sate their hunger. While the others stand audience to this, Aurelius is the first to respond among those returned to reality... spurned by both heartache and purpose. Somehow, he manages to pause just enough to shove restorative potions into the hands of his companions before turning his attention to his beloved Yana. In all his long life, no words echoed so loudly and determined in his mind. Aurelius' formidable intellect went to work... the zeal bringing every minute detail of his extensive research and work to create Yana coming back to him with crystal clear clarity that can only come with the absolute certainty of purpose. Yana will live again... science and light reason will triumph over the darkness. He would take back what was taken and defeat those capricious forces at their own diabolical game. Aurelius went to work, oblivious to all other things as he laid out his tools and the necessary component. Once the baleful specters finishing their gruesome repast and the screams but memories and echoes, the fog rolls in as if whatever was holding them at bay disappeared. As the fog rolled over the shades of Kelebros' countless victims the ground itself seemed to swallow them back up to presumably return them to their misty ethereal prison from whence they came. An eerie hush falls over the forest as the fog recedes like the rolling out of the tide. "Okay... anyone want to tell me what in the Nine Hells just happened here?" Ephram says stunned by the flurry of events that in a split moment took him from fighting for his life to being an audience to pure bedlam to quiet with only sounds were of the doctor working and the return of "normal" night noises, such as crickets, which had been absent before. Aurelius did not even register the question from Ephram so singularly focused on his task to revive his beloved creation. The others busied themselves administering or taking the healing salves and the restorative tonics that Aurelius had given to them. Raven stood up groggily as she shook herself from the experience with the healing and Val did the same... her body was mended, but could the same thing be said of Val's mind and more importantly of her spirit? Only time... and perhaps Torag... would tell. Jonathan, perhaps in gratitude for Aurelius' heart rending sacrifice, stood in silent vigil like a sentinel over the good doctor's work even as Alexis did the same, but perhaps for entirely different reasons as the shifter's brain busily worked to process this new information... or not. He was Alexis after all. So under this vigil, Aurelius worked and toiled... the science was sound... Yana would be back to him soon. Only that Yana did not come back... the body functioned mechanically, but she did not come back. Yana's eyes were open, but empty. The spark that made them Yana... made her alive... was not there, making what Aurelius held in his arms only slightly more than a mannequin. Aurelius' mind swirled in denial... the science was sound. It was sound! All had been done as before, he was sure of it... so why wasn't Yana revived. He must have missed something... omitted a minute detail... something. Aurelius knew one thing for certain, he would not stop... he would not rest until he had brought her back. If it took centuries in that forsaken place, Aurelius would never relent... never give up. He would bring her back. So absorbed in his task, Aurelius did not notice the arrival of the cavalry... literally as the companions heard the thundering hooves moments before they were surrounded by several dozen horsemen all bearing the royal crest of Dementileau and badges of inquisitors. A badge familiar to Kallev, Alexis, Val, and Raven... because they had seen it before. They had seen it on the man that now rode to them as the formation parted momentarily to allow him to pass. Jonathan recognized him as well. "Well, it appears that justice smiles on us this day... and sees the wicked and unlawful delivered unto us. If your past misdeeds are any indication, then that you and conspirators were probably responsible for that." Luris said, his words dripping venom as he levels his black blade at Kallev and the remains of Kelebros. What sympathy and regret that he had expressed in Hofstra was now long gone. "Still that is not why you all are now bound by law. While nothing would please me more and fitting for your crimes in Hofstra for me to sentence you all to summary executions right here, right now, but The Queen has decreed that you are to be captured and brought forthwith to her... alive... for a public tribunal for your misdeeds." "Jonathan?! What are you doing here consorting with the likes of these... murderers?" Judas exclaims as he recognizes the former aspiring inquisitor before noticing what his charge was guarding. Aurlieus with his portable kit and vials blood and pieces of Yana in mid-process in context painted a very... unflattering picture, especially in the eyes of the inquisitor. "And by the black gods, what is that... abomination?! Seize the foul necromancer! Even if he is not guilty of conspiracy with the Butchers of Hofstra, he is surely guilty of pursuing forbidden and immoral practices and creating abominations that are an affront to and perversion of nature itself. Take him away!" "Jonathan, explain yourself... why are you here consorting with these criminals, butchers, and necromancers? Answer truthfully or I shall have no choice but to hold you guilty of conspiracy with these criminals. " Judas commanded as several men to restrain and drag Aurelius away from his creation before looking down on Yana's motionless body in revulsion and motioning for several inquisitors. "Cleanse it!" Everyone recovers 10 hp due to distributed healing from Aurelius' potions. Yana 0/60 17 12 15 18 +1 +3 +2 30' (40' Fly) Bite, Claw, Spear None None? Last edited by Xian; 09-06-2018 at 01:58 PM. Aurelius grieves over Yana The doctor works with single-minded but serene intensity over the body of his creation, oblivious to the rest of the world. Yet, as he goes on, his work becomes increasingly frantic. He is not seeing the reactions he'd expect. Only the most simple brute mechanics are functioning. Everything else ... 'Why isn't it working?' repeats in his mind again & again in growing desperation. Most everyone else long lost count of how many times he rechecked over everything, but it is at his thirteenth exam that Aurelius is interrupted by brimming tears. Lost and seeming impotent to fulfill his vow to his dear Yana, the stern, methodical doctor is overwhelmed and breaks down, clutching onto her body and sobbing piteously. It is this scene that the horsemen so cruelly interrupt. Aurelius misses most of whatever the leader is saying ... until he starts insulting his dear Yana. He bristles heatedly but only springs into action when guards are motioned toward him. Fixing his glasses, "Of all the doltish oafs ..." Bow in hand, Aurelius stands protectively over her and nocks an arrow with a filled vial at the end, though remaining lowered for now. "Stay where you are, and do not touch her. That's alchemist's fire on the end; I'm sure you've heard of it before," he deadpans beneath a tear-streaked face and wearing a smock stained in blood and countless alchemical compounds. Sounding Take 10 on Diplomacy: 24 to be convincing.coolly civil and bearing a tight smile that does not reach his eyes, "Now, let's think logically about this, shall we? First, who the hell are you? I don't know you from some brigands in disguises meaning to toss our stripped bodies into the fog." "Second, in the event you can proffer some evidence that you are not just a boor, but some legitimate authority over this area ... wherever that is ... Dr. Alymer at your service. I'm a chemist and surgeon, a healer if easier to understand. I am no more a necromancer than you, and had anyone of you the most cursory of magical training, this would be laughably obvious. That," his voice choking with emotion. Tears threaten to brim again before he takes a breath to Take 10 on Bluff: 21 to be convincing while hiding plenty.continue, "That is my dear assistant and my current patient. I'm trying to revive her after facing that ... thing," motioning to huge pile of collapsed vegetation and burst pods. "Seriously, how did you miss the dead mage's plant monster cadaver? Or our blood still coating its vines? Or the plant slime on half of us?" "Third, I know these folk because that monster attacked all of us. I never heard of whatever charges you are laying at their feet," sounding more than a little suspicious. "Speaking only for myself, if I can bring my assistant with me whole & untouched," the wearied doctor breathes a deep, steadying breath, trying to draw on strength he feels he hasn't. This is a fight cannot hope to win, not surrounded like this. Any chance at surviving to bring Yana back, that is the most important thing. "If that, then I will come with you quietly and submit to examination by whatever competent magical expert you wish." His grief filled eyes then harden with ferocious resolve. His hand draws slightly on the taut bowstring. Yet, his voice remains flat, "If not ... is that really reasonable to risk you & your men over this?" Bull's Strength extract: +4 enhancement Strength, 5 min. Last edited by dbaque; 09-06-2018 at 03:34 PM. Sighing at being unable to help her sisters, Kallev places the pendant on her neck and says see you soon. Upon hearing the horses approach, Kallev smiled Count Judas, Ah, our ally who claims he did not commit doing good well for the people like we have. It's funny for you to make such acquisition. Though I'm afraid the answer is the same. Please don't make this harder then it needs to be and just leave. We wouldn't want any innocent people to be harmed, or taken away to stand a false trial. There's no justice in that. Though I am sure you will claim something of the sort. Like, it's your duty, etc. All fine words for those who truly committed crimes. Crimes in the name of justice, begone. she waves the nights away. Stepping by Alexis she whispers to him, Kill me if they try to take us. while she holds her dagger to her own throat. Failure to comply, will result in my death, which directly goes against your orders. If you would like me to attend an audience or court, then do it properly and send a letter of invite to my home. she commented, with no fear of actually performing the action. She believes this to be a continuous yes dream and even if she slit her own throat, she would somehow remain conscious and alive just like before. Last edited by kaylara; 09-06-2018 at 04:58 PM. Alexis remained silent as he observed the Doctor's struggle. Alexis considered his threat, to stop the Doctor from making such a grievous mistake in judgment. Yet the man had simply... done it anyway, believing-- mistakenly-- that the sacrifice would would simply be one of physicality. Of life. Such is not the way this world works, Alexis has recently learned. This place hunts and hungers for more than life. It devours hope. It sustains itself off fear and terror. It will strip from you everything but your life. To perish here-- a physical death of the body-- is the kindest fate anyone can hope for. It is the deaths of the mind, the spirit, and the heart that are most likely to find you first. Once one befalls you, the others will not be long after. This is why Alexis remains silent. There is nothing he can offer, no magical resurrection or wondrous power than can undo the Doctor's mistake. There is simply one cure that Alexis can offer. He retrieves his greatsword from the ruins of the area. Hefts its weight. Rolls his shoulders and winces with his injuries. Whatever actions Alexis can offer, the greatest of them is simply to remember. Not just to remember, but to think the best of them for what they did. Even if it is a lie. But if a lie is what it takes for others to wake up in the morning, then a lie is what is needed. The question remains, however-- will the good Doctor require a lie to wake himself in the mornings to come? Alexis is interrupted from his introspection by the sounds of new arrivals. Now this is the kind of fight that Alexis could hope for! "Judas-Plant returns!" Alexis chirrups gleefully. He is also entirely oblivious at the connotations of his nickname in the context of recent events. But, well, Alexis, right? "Plant-Judas brought horse-soldiers into forest? At night?" Alexis just shakes his head sadly at the unwise decision. "Hofstra-Queen must have Plant-Judas' balls in rock-grip." Alexis is obviously in a mood to go down swinging, and this is but the preamble to a glorious final stand. The slightly-insane smile on his face is proof enough of that. Jonathan raises his arms protecting Aurelius and company from the rumbling of hooves and wafting of dirt kicked up from the sudden confrontation. The shocking reunion with his old friend from University catches Jonathan off guard, and into a pause of mental calculation and deep brooding introspection … on what can possibly be done now in this terrible and sudden predicament! Jonathan knows the the personality of this Judis intimately. They were partners, confidants in many university tests and trials, gaining extensive knowledge on demonology, necromancy, and dealings with occult occurrences and practices. Judis and Jonathan reached the heights of their fields in many collaborations. Judis Luris! Jonathan raises his hand proudly as he means to respectively greet his old friend. We are eternally grateful to be graced by your timely presence! Look around, dear friend, to see much battle has taken place with this team of valiant individuals--defeating this terrible shamble of demonic plant abomination! His eyes are wide with heartfelt honesty, knowing that he needs to plead his case here now in earnest, or all is lost. Judis, old friend from our distant days of initial training, it is grand to be reunited with you under these timely circumstances. You have saved us in fact! These others and I have been struggling on the brink of sheer torment--lost in this forsaken jungle--waylaid by mysterious creatures, seeking to vanquish us from the face of existence! With a trembling hand, face sincere with emotion, Jonathan whips his finger over, scorning down the heap of disheveled rubble that is the remains of Kelebros, Judis, this is the perpetrator! This creature is the true butcher and necromancer you are looking for to be handed over to the greater authorities. His name is Kelebros! He is responsible for all the bloodshed that you see now. The lady Kallev, poor thing, is at her very wits end! -indicating the dagger that she holds to her own throat. We have been tortured Judis in this vile jungle, by dark forces, spawned by the now diminished Kelebros. This man at my side is Aurelius Alymer. Please forgive his outbursts, they are unwarranted. His love, his dear companion has been slain and corrupted by the likes of the fiend Kelebros once more. Aurelius is a mere surgeon at his wits end as well, over his tremendous heartbreak. He mean not his emotional words. We fought valiantly dear friend, saving ourselves from slaughter, in the name of the Queen’s Inquisitors! This last statement, he pauses before he reveals it, because it isn’t completely true. Jonathan can not necessarily speak for his friends, but his actions were indeed in alignment with the Queen’s decree to purge demonic occurrences. Jonathan is not a terribly intelligent man, while his social prowess and charisma are more weighty, Lastly Inquisitor Luris, before I leave you with your decision … I will beg you once more to reconsider your accusations. These are simple traveling folk, waylaid by evil purposes I will reinforce. Direct your eyes to the fallen cleric in the distance, indicating Val as she lay unconscious on the jungle floor. She is dressed in the noble order, she fought to save our lives, and now she is on the brink of death if not tended to immediately! Will you let us go to her? Will you not, in fact, tend to her yourselves? She is sweet and innocent. She does not deserve this unfortunate end, dear Judis. Jonathan finally lowers his tone and hangs his eyes low with sorrow, now finished with his sincere and dire plea, awaiting the Inquisitor’s response. Last edited by WhiteStag; 09-12-2018 at 02:24 AM. "Judas-Plant returns!" Alexis chirrups gleefully. He is also entirely oblivious at the connotations of his nickname in the context of recent events. But, well, Alexis, right? "Plant-Judas brought horse-soldiers into forest? At night?" Alexis just shakes his head sadly at the unwise decision. "Hofstra-Queen must have Plant-Judas' balls in rock-grip." "As colorful as ever... The Law and the Queen of Dementileau are both unrelenting in their insistence." Judas says wryly to Alexis' proclamation. "Still, there is truth to your words... I have not summoned three dozen inquisitors for this task on the account of you and your companions." "Doctor... necromancer... though the means you may use are different, the end result is the same. Dead parts sewn together and given false life in vile mockery of the living. I know too well of your kind of "patient"... it reeks of the same veiled insanity of Doctor Victor Mordenheim and his abominable creation. Your crime is as much violation of the natural order as it is the law and shall be prosecuted accordingly." Judas replies unimpressed by Aurelius' explanation or his threat as with a motion weapons are drawn, arrows nocked, and a click familiar only to those with knowledge of firearms. Aurelius could see in the Count's eye a glint of familiarity as he looked upon with open disgust at Yana's still form. "If you are a man of intelligence as you say you are, then realize how meager of a threat your single arrow of alchemist fire is against three dozen of her Majesty's Inquisitors... should you insist on your current course then you would be struck down where you stand before your second arrow takes flight. If you do not recognize the seal we bear then you must not be of Dementileau, though that fact does not absolve you from the bounds of our laws in these lands." It is then that Kallev's outburst draws again the Count's attention. His eyes merely turn colder and harder at Kallev's words, though a slight smirk did appear as he began to speak. "Denial to cast off the yoke of guilt in the eyes of uninitiated? It was your willful hand that summoned both the magic and dark creature that laid waste to an entire township and the slaughter... the murder... of nearly all of Hofstra's men, women... and children. Trust not simply my words... look at the eyes of her traveling companions and see the truth there." Judas said coldly unmoved by Kallev's counter-accusation as he pointed to Alexis, Raven, Val, and Ephram. He then unrolled a scroll and it bore a magical seal. A seal that Kallev recognized immediately as her mother's. "For the nature of your crimes and at the behest of our Queen, you will pleased to know your home has already honored the request for extradition and for you to stand trial here under our laws. Do not be concerned, you will be given the opportunity to examine the document with counsel and confer with your country's emissary as deigned by the law." When Jonathan made his plea to Judas, it was perhaps the first time a glimmer of sympathy shown on Judas' face before the hard iron mask of duty was back in place. "Yes, the creature... me and the other Inquisitors here are familiar with their ilk, but it matters not of what actually transpired here. This is not the crime they and the good doctor are presently bound by law and will stand trial for. Should we we find evidence of further misdeeds then it will be added, but likely will be akin to a bucket of water being thrown into the ocean." Judas declared as he pointed first the Kallev and then to Aurelius. "You have a kind and trusting heart, Jonathan, and your misplaced sympathy for these criminals clearly shows that. Clearly, you were ignorant of their true natures nor were you complicit in their past misdeeds, so submit quietly and I will see to it that you are shown leniency and consideration to that fact. Do not let misplaced loyalty cause you to share the fate of these criminals." It was then that Kallev made known the threat to her life and standing by Alexis who seemed too eager for the battle and Aurelius still with his bow drawn with his volatile arrowhead ready to go. "Queen Renier has decreed that those involved in the Massacre of Hofstra will stand a full trial in front of a special tribunal convened and overseen by the Queen herself. I am bound by duty to honor her decree." Judas warned the embattled companions who seemed to ready to fight and bluff their way out of this request. "So, while I would gain a measure of satisfaction to see you struck down, by our hands or your own, it would be a simple matter to simply revive you with means at our disposal and then restrain you for transport to fulfill my Queen's orders. Resist or surrender, the outcome will be the same. So as the saying goes we can do this the easy way or we can do it the hard way." Aurelius already sees men with hands wreathed in silvery fire moving towards Yana, their intent and purpose clear even as the other inquisitors fall in practiced columns and ranks to surround the party with their weapons at the ready. Any questions, please post them in the OOC, unless it is very specific to your character, in which case post to your private thread. Onward! Last edited by Xian; 09-16-2018 at 01:30 AM. Aurelius defends Yana Eyeing Jonathan during his impassioned plea, Aurelius reluctantly concludes that this inquisitor is the real thing. Still, the staggering account of some horror perpetrated by the folk they ran into. It boggles the mind. However, it is a story clearly better digested long and slow in peace, not amid this tense stand-off. The house arrest that the inquisitor threatens, a quiet place to plan his defense, it is hardly the stuff of nightmares, more reminiscent of presenting a new paper at his old university. ... There is just one uncompromising detail. The doctor does not flinch before the inquisitor's ultimatum and show of force. The only thing garnering a reaction is a curious twitch of his eyebrow at this Dr. Mordenheim. 'Note to self: find anything on Dr. Mordenheim's research.' The normally giddy feeling at another researcher's mention is drowned out by the standoff. Speaking methodically, "You are misunderstanding the calculus at work here, Inquisitor Luris. I have no illusions of being able to best your men here. Rather, it is quite simple. I am so uncompromising that my Yana remains untouched that certain death is an utterly inconsequential fear to me. The calculus is then yours, whether that destruction is worth the trouble & risk to put down a desperate man." "But," continues Aurelius Take 10 on Diplomacy: 24 to be convincing.logically, "if your men's safety is not so dear to you, surely, your duty is a better motivator. If you are charging me with perversions against nature, what is the best evidence of either my guilt or my innocence?" Pausing for effect, he nods his head toward his corpse behind him, "Yana's body right here. I claim right now that my work is more akin to the reviving magics you endorsed than any zombifying or this abomination you mentioned. Do you or anyone here have the technical expertise to prove that wrong? If not, how about we serve the law better by leaving her body for more suitable experts to examine & test my claim?" Kallev Littleton Kallev The thought of calling the dark powers to save them from this injustice was overwhelming. But deep down, she knew doing so would not be right.shook her head slightly, If I killed an entire village filled with hundreds of people in a matter of seconds with a mere thought, what do you think the few of you could possibly do? Ask nicely to subjugate ourselves to your dark queen in hopes of a fair trial by a special tribunal? Do you even realize how stupid that sounds? Your queen raises villages in fear and oppression of magics. Because of the laws and I'll education, townsfolk openly attack and kill witches good or bad. Just look at how you view the poor doctor who merely wishes to save lives. Is this how you uphold law and order? Do you not realize your queen has been harvesting people for years and you blindly serve her under the guise of Justice and Honor. I ask you this. Do you really want to serve law? Then serve the greater law. But, you'll probably call that blasphemy. My lands of Luminous allow and teach magics so they can be used for healing and protection. she paused briefly, looking over the lynch mob gathered around them. Do you know why you didn't share the same fate as the villagers? It means one of two things, one, that you are innocent and all victims of hers. Or two, you are the queens personal tools and she brought you back to Kallev hopes it #1 and #3 is its all another illusion again.. darn smoke and mirrors...serve her purpose. She glances over at the good doctor, Aurelius, he needs none. What ever he believes is all he needs. It's how justice works here. Though you didn't believe me about the sacrifice, so why believe anything now.. she informs the good doctor. She grips the amulet in her other hand an focuses on the amulets powers, praying for it to If it comes all the way down to this.. then she's out of options... exhausted, and should be at -2 lv's, she has no spells and there all on on the brink of death. There's no fight here, its a slaughter and she knows it. She also feels they are victims of blind justice as well, tools used by the queen. She doe's not want to harm the innocent. But she also will not go to the trial and be politically used. Though at this point with the order's, theres not much she can do.teleport them all away to Luminous. Last edited by kaylara; 09-17-2018 at 01:13 PM. Judis this is Crazy-Making! You are not like this old friend. You were once patient, compassionate, observant and just! You ride forth now, making profound accusations at the drop of a hat! Blind Justice as the lady has stated. This is blind justice. His inner strength wants to instantly break free and waylay these lowly thugs. But he keeps his rage at peace … at least for the moment. Turning back to the cavalry, Judis, I insist you step down from your high horse (meaning and not meaning to make the pun), and speak with me face to face as old friends. Call your guards to abate for a time, and let us shake hands and reconnect as brothers, yes? Jonathan then casually withdraws a little trinket from one of his pouches on his belt. It’s a small bundle of, what looks to be, dried grasses wrapped in some simple twine and fabric. With the other hand he strikes a tinder twig into flame and lights the little bundle easily. The curious stream of white smoke whisps about in his hands, and he quickly passes it across his face and under his nose, while at the same time drawing in a quick snuff of smoke- deeply into his lungs. I light this sage as a symbol of peace, old friend. Please come down and let us reunite. The breath of smoke then courses through his bloodstream and invigorates his mood- with a delightful shudder that tingles over his body. The burning bundle is then casually discarded to the ground and Jonathan dusts off his hands, giving Judis a broad and open smile. Actions -The bundle of grass is a spell reagent, casting Mage Armor on himself. -Jonathan is sincere with his request for peace. He does not wish to fight with his old friend. But he nevertheless, armors himself as a simple precaution. OOC -Xian, if my count is correct these last rounds, I believe Jonathan’s HP is a little higher then you have indicated. My count should be 45hp. - Mage Armor: 5 hours. Ac bonus adjusted on chara sheet. Spells:: Level1 - 0of2 spell available. Last edited by WhiteStag; 02-19-2019 at 05:15 AM. "Are baseless accusations against my Queen and hyperbole your only defense? Perhaps you continue this charade of denial for the sake of the uninitiated, but it is meaningless to me as I witnessed... and felt... firsthand the dark powers that you unleashed." Judas says with disgust at Kallev's counter accusation and indictment of his Queen and he rolled back the mail on his left arm to showed the burn scars. "I witnessed your power as it set ablaze a town and burn me. Then when I lawfully attempted to place you under arrest in accordance to Dementileau's laws, I witnessed you summon the dark creature and direct it to murder me. The dark creature then butchered the town's citizens before I was borne away. Were it not for the grace of my so called "dark" queen, I would have surely been among the murdered." "Say what you will, but I serve the law of Dementileau. It is to that law that I swore to uphold and enforce, not this "greater" law or the laws of your land of Luminous. What those laws say in these matters is clear, both yours and the good "doctor's"." "I would suspect even in your lands, especially if they be versed in magic as you say, would recognize The Mark that now adorns your face that no magic or craft can hide. Even without my personal witness to the acts, The Mark serves as incontrovertible proof of your guilt... in any land." Judas continues as he points out the gruesome scar on Kallev's face. "I suspect that fact is what drove the approval for extradition and to stand trial by our laws by your people. Call it what you will, but this tribunal is for the people... the families of those murdered in Hofstra, so they may be granted justice. Frankly, it is more than you deserve." "You are misunderstanding the calculus at work here, Inquisitor Luris. I have no illusions of being able to best your men here. Rather, it is quite simple. I am so uncompromising that my Yana remains untouched that certain death is an utterly inconsequential fear to me. The calculus is then yours, whether that destruction is worth the trouble & risk to put down a desperate man." "Desperation? Madness is more accurate and I think you overestimated the threat your arrow actually poses. These are no common soldier. These are the Queen's inquisitors." Judas says unimpressed by Aurelius' stand or his plea. "We are not blind doctor... I need no expert to tell me what that is. The wings, its claws, and the patchwork of harvested body parts clearly reveal its true nature. 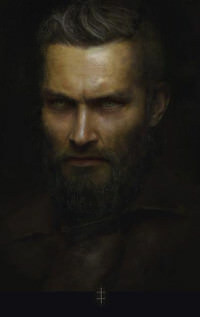 Much like Mordenheim, you are oblivious to the path of madness and damnation you walk. Like you, he did or would not see his creation for what it truly was until it was far too late. Still you have a point, not that the sworn testimony of over three dozen inquisitors would not be sufficient, some physical evidence will be... constructive." "Bring just the head. I will not risk it reviving on the way and going on a rampage." Judas orders as Aurelius feels a spell come over him and he could feel the sensation leaving his extremities as he began to lock into place. The strong willed elf easily shrugs off the effect and for the moment, Judas and the others have yet to notice that he did. "Judis this is Crazy-Making! You are not like this old friend. You were once patient, compassionate, observant and just! You ride forth now, making profound accusations at the drop of a hat. Blind Justice as the lady has stated! This is blind justice." "Blind? Clearly you never truly knew me or whatever you are smoking has affected your mind if you believe that I would be so casual in carrying out of my duties as High Inquisitor." Judas says firmly at Jonathan's outburst as he intoned the motto of the Inquisitors. "You have always let your heart get the better of your head, Jonathan. So then... as a friend... I shall ask you only one final time, stand aside and let justice be served." OODM: OODM: Kallev, Jonathan, and possibly Aurelius since they are "home worlders" or lived here long enough know that "The Mark" refers to a scarlet letter of sorts that manifest itself on person that has committed some unspeakable act or wrong and it cannot be masked or hidden by any means, magical or non-magical. @dbaque - The Will Save was so good they did not notice Aurelius breaking the spell. Last edited by Xian; 09-22-2018 at 01:34 AM. With her prayer unanswered, she defies all and takes fate into her own hands. You claim to uphold law, but look at what you have done. Sure you felt the magic that slightly burnt you, but not even recognize that it's because of that, my actions saved your life from the creatures. A small price to pay for a life. Then, instead of helping to put out the small fire before it grew bigger than a camp fire, you ran. Ran away like a coward looking for a way to deliver justice and repot a law breaking instead of saving 1000's. You deserved the justice that was delivered to you that night and I paid for it. Call it Karma if you want. Tell them the truth of how it was because of your poor judgement and how now I'm your scape goat. Your laws are only as good as the people, nothing more than an excuse for the privileged. she commented with a smile that said go f yourself as her dagger slices down her jugular taking her life. It was the best she could do to help her family and friends. Deep down Kallev knew her actions were meant for goodness, but it ended in tradegy. It was never her desire to hurt the townsfolk, but they all died regardless. The lease she could do is join them in death and beg for forgiveness. Last edited by kaylara; 09-22-2018 at 02:29 AM. Alexis is Alexis. This has been demonstrated many times over in the past few days. But what does that mean. What is it that is stated when Alexis is, in fact, Alexis? What if Alexis is Mad-Val? Or Mad-Val is Alexis? That is confusing, so Alexis isn't going to think about it any longer. He's going to continue to think, though. To think about everything being done and being said. That Kallev is making her choice. Whether her choice is poor or not remains to be seen. It is not the only death upon one's own hands that Alexis has witnessed. The problem he is running into is that Judas-Plant isn't wrong, at least not as Alexis understands the point. So Alexis can't and won't fault the man for being a professional and simply doing his job. Whether he should be condemned for probably enjoying that job is not a point that should be up for debate. But Alexis still has to ask himself a very important question. What is it now, Alexis-Body? You know why: we cannot remember forever. No. Not that, Alexis-Brain. Why is that it? Why is that all we want? Oh. Then Alexis is going to try being not Alexis for a little bit. "Alexis will walk with Judas-Plant, if Judas-Plant will word-offer that Judas-Plant will not blame Alexis for Alexis' much more pretty-face. Alexis wants to know things of Queen. If Judas-Plant promises Alexis one truth-answer from Queen, Alexis will not murder-kill Judas-Plant and half of knight-men before Alexis dies." Alexis' offer is quite simple, and it is obvious that he has one intention if his request is denied. [Alexis glances towards the corpse of the Fog-Monster. "Alexis will also suggest that dead-souls may belong to Forest-God if perish here, not to worship-god. Careful-think, Judas-Plant. Alexis readies to charge Judas if his two requests are denied-- the former being him asking if he's going to be lynched just because of how he looks. The second is exactly as stated. And of course he Nat 20s the 29Intimidate to inform them that he will gleefully kill as many of them as he can and possibly send their souls into an eternal prison. Because Alexis, apparently. This also took me a lot of consideration to figure out how to resolve it, particularly after the events with the fog-monster. Last edited by GeoAvanti; 09-22-2018 at 11:52 PM. Aurelius defends Yana During Judas' exchange with Kallev, Aurelius cannot help giving rather shocked looks. While he is not thinking this fellow an altogether credible witness at the moment, that mark on her face (not to mention her failure to deny it!) is giving a rather distinct, unflattering impression of this seeming half-mad lady. Then again, he can't say that his exchange is going any better. "Madness? Many might call the love for a child madness," he replies sorrowfully. His expression pales further as the inquisitor remains unswayed. The thought of losing his last trace of his Georgiana, of desecration of her & Yana, it is like a icy vise about his heart. Tipping the top of his bow toward Judas, "And that reasoning right there is why you have no business identifying rare flora & fauna. Not only is your wish to destroy her body founded on cosmetic appearances when you can't even distinguish patchwork-grafting from surgical sutures ... seriously, do you not have mages that can grow wings or claws temporarily? They are not so odd.... but it is founded on a likeness of her dead body to a case I have never heard of, depriving any hope of a defense here. She is not some zombie or abomination. Are you going to punish me and her by destroying her body before anything resembling a fair trial? If you so fear ..." He can feel some ensorcellment attempt to take hold and pacify him. But steely resolve and his towering mind shake off the enchantment. At this moment, as if to clinch his impression of her, Kallev attempts suicide. 'Again? Well, did the attempt in the dream realm count?' Consistency with prior imbalanced character aside, it still shocks the good doctor. For a beat, Aurelius pauses to consider whether he should abandon his post in defense of his dear one's body, whether he should spend any effort in attempting to save a rather terrible life. But the hesitation lasts only a beat. He throws away the element of surprise after their paltry enchantment. The good doctor tosses his weapon down and drags the bleeding woman back to the tools of his trade to Take 10 on Heal: 24.save her life. Tearing the dagger out of her hand, Aurelius tosses it behind him. "Heavens above, damn fool woman. As if I'll ever let her near so much as a butter knife again." Feverishly staunching the blood and sealing the torn vein, he can't even spare any glances to the soldiery surrounding them. "Unless one of you knows how to stitch a major vein closed within half a minute, keep your distance and stay your parlor tricks." While seeming absorbed in his work, Dr. Alymer picks up where he left off, "As I was saying, inquisitor, if you so seriously fear a rampage by someone who is not only quite dead despite my emphatic attempts at revival, who only tried to save us, and to whom all we here, your friend included, owe our lives ... then, for heavens' sake, bind her body in whatever manacles you desire and keep the key until our trial. ... Isn't that what the law says to do with dangerous criminals?"